I haven’t saved enough money to afford accomodations at the Shangri-La’s Mactan Island Resort and Spa, but I have enough for a day tour. Or as they call it, a day in paradise. It was paradise indeed. True to the Shangri-La tradition of excellence, the island resort is a great getaway from the city (which is only 30 minutes away). From the lush green gardens to the stunning white sand, from the sparkling waters of the sea to the welcoming cool of the infinity pool, from the abundance of available facilities to the attention of their staff, Shangri-La makes sure you get your money’s worth. A day in paradise costs Php 2,000. This includes access to their beach, use of their pools, towels, a discount for their Health Club services, and a lunch buffet at the Tides. Ah, the Tides. Where do I begin? The lunch buffet is available from 12 noon until 2 o’clock in the afternoon. There’s a wide array of international and local dishes, set up in different areas of the restaurant. I suggest that you go around and see what’s available, or you might end up piling food on your plate and getting the oddest combinations. Then comes the dessert. 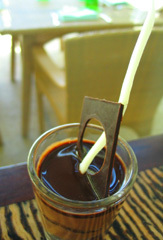 They have a wide selection of the freshest fruits, divine chocolate concoctions, biscuits, marshmallows and fruits you can smother with chocolate and crepes made to your liking. ‘Twas paradise indeed. After that gastronomic adventure, I settled down for some peppermint tea before I head off to the airport. Another great thing about Shangri-La is that they have a regular shuttle going to and from the airport and shopping centers in Cebu city. So instead of having to shell out money for a taxi ride to the airport, I just waited for their airport shuttle. I was just a tad overwhelmed by the attention from the Shangri-La staff. It started when I asked the front desk of their shuttle schedule, the guy behind the counter got on the radio and asked what time the shuttle will be back. He then calls another staff to assist me with my bags, and he continued harassing the shuttle driver to hustle back to the hotel. To my surprise, it wasn’t just a van; it was a 20-seater coaster. Another surprise came when the bus driver drove off after I settled inside the bus. I have the whole coaster to myself. I feel so special. As we near the airport, the driver asked me if I already bought souvenirs. I told him I already bought some, but I want to buy a couple more things. I said I’ll just buy them at the airport. The prices they give you at the airport is too high, he said. He then detoured to the tourist shops near the airport entrance. Well, it wasn’t cheap there either, but it was still cheaper than the overpriced stuff at the airport. I picked a pack of danggit and a couple of pawikan refrigerator magnets for my friends. After paying, the lady handed over my purchases to somebody standing behind me. I turn and lo and behold, my “driver” was standing by to carry my 500 gram pack of dried fish. Now THAT is service. 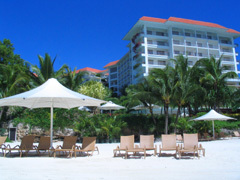 Shangri-La Mactan is in Mactan Island, along the Punta Engaño road. It is 20-30 minutes from the foot of the Marcelo H. Fernan Bridge (Mandaue-Mactan bridge), and about an hour from Cebu City. From Mactan, you can ride a jeep going to Punta Engaño and get off at the gate to the resort. The fare is about Php 11. You can also take a taxi, and it will cost you approximately Php 80 from Mactan, and Php 150 – 170 from Cebu City. Hi, how do you avail of the daytour in shangri-la mactan island? we are planning to go to cebu in december and we really want to go to shangri-la. do they provide shuttle from the resort to the airport? Hi Beng! Just go to the gift shop (I forgot the name), and tell the staff there that you’re going to avail of the day-trip package. They provide a shuttle to the airport and to 2 Cebu City Malls – Ayala Center and SM. Ask the conceirge about the shuttle schedule. HI Nina! Did they provide you a locker for this day tour? Are the shuttle to the malls free of charge? Thanks. Wow, that place is a paradise indeed! I am thinking of visiting it next month with my family. Thanks for this post.